D’EST. A Multi-Curatorial Online Platform for Video Art from the Former “East” and “West” is a project initiated by Ulrike Gerhardt at District Berlin. A contemporary video databank developed along topical focuses, D’EST from 2017 maps female* and collective positions that reflect the post-socialist transformation. 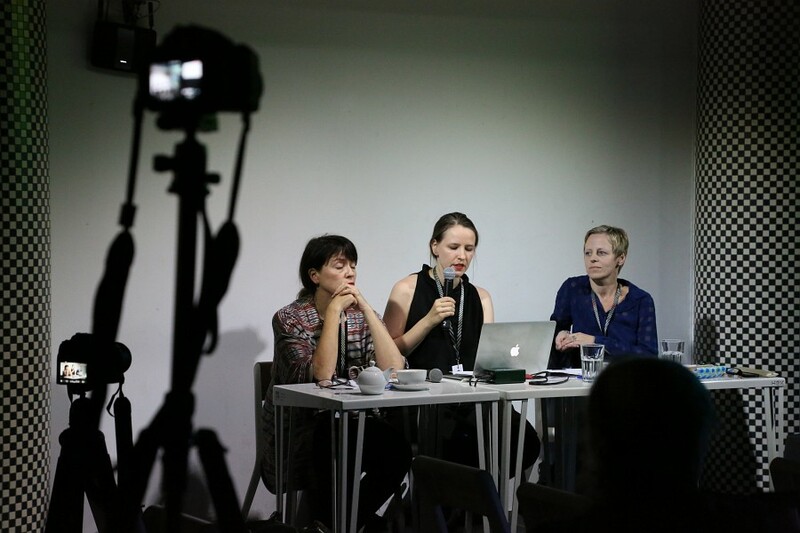 European curators and cultural producers introduce contemporary video art that addresses the period of transformation in the 1990s from a feminist perspective. At the WRO Art Biennale 2017, D’EST’s first line of inquiry The Suspension and Excess of Time, a collaboration with the Video-Forum at Neuer Berliner Kunstverein (n.b.k.) will be introduced by its curators Kathrin Becker and Jana Seehusen by way of two selected video works. Screening and discussing Sanja Iveković’s INSTRUCTIONS No. 2 from 2015 and Ulrike Rosenbach’s 1976 video Glauben Sie nicht, dass ich eine Amazone bin. (eng. : Do not believe I am an Amazon. ), visitors gain insight into the politics of living as a woman and how they manifested in (Post-)Yugoslavia and West Germany. Exploring the role of time within two political systems and paying tribute to speculative temporalities, Becker and Seehusen will trace women’s everyday experiences in the former “East” and “West” before and after 1989/1991. The presentation of first ideas and vectors for D’EST: The Suspension and Excess of Time will be moderated by Ulrike Gerhardt. D’EST: The Suspension and Excess of Time is a project by District Berlin in collaboration with n.b.k. Video-Forum. INSTRUCTIONS No. 2 is a remake of Iveković’s famous work Instructions No. 1 (1976), in which the artist is looking directly at the camera while painting black arrows on her forehead, cheeks, chin and around the mouth. The signs are reminiscent of instructions for applying skin care products and facial massages or of measures of plastic surgery. The concentrated process of marking takes place over almost the entire duration of the work. Towards the end Iveković rubs the markings into her skin with her hands until they are partially absorbed and partially leave faint traces on her skin. While the action from the 1970s is exactly repeated by the artist in the new video, the differences to Instructions No. 1 are showing both in Iveković’s face and in the employed new digital recording technology. Both went through a process of transformation of almost 40 years. 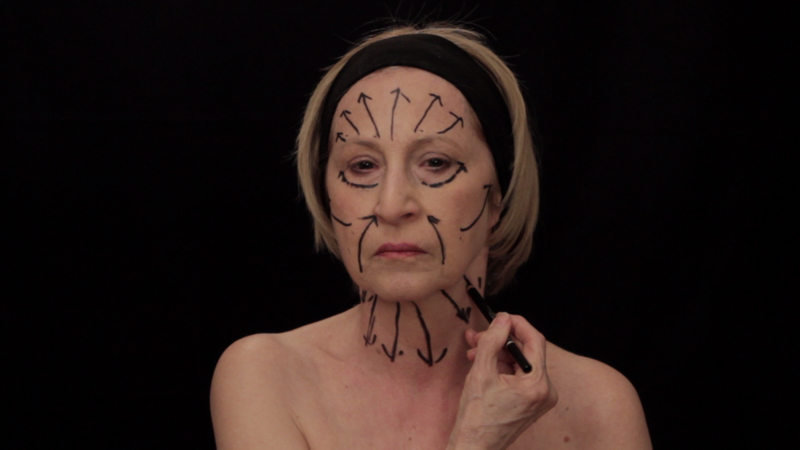 Iveković juxtaposes the aging process of the human being with the process of modernization of technology. Sanja Iveković (DE) was born 1949 in Zagreb and belongs to the generation known as the Nova Umjetnička Praksa (New Art Practice), who during the Croatian Spring in the early 1970s were able to liberate themselves from the dominant constraints of academic art. She was the first female artist in former Yugoslavia, who publicly professed feminism and understood this as a gesture of disobedience against the communist regime. Iveković has had solo exhibitions at the Museum of Modern Art, New York (2011-2012), at South London Gallery & Calvert 22, London (2012-2013), at the Van Abbe Museum, Eindhoven (2009) and the Muzeum Sztuki w Łodzi (2009), and was the winner of the Camera Austria Award in 2009. In Glauben Sie nicht, dass ich eine Amazone bin. (eng. : Do not believe I am an Amazon. ), Ulrike Rosenbach evokes the history of female representation since Greek antiquity. The face of the artist and a reproduced cutout of the Madonna of the Rose Bower (1448) by Stefan Lochner are projected into one another by way of closed-circuit-video. The icon of the Holy Virgin is animated by the video-portrait of the 33-year-old artist practicing archery. Allegorically representative for the standardized roles of women as “mother, housewife, prostitute, saint, virgin or amazon,” Rosenbach shoots fifteen arrows on the face of the Madonna and simultaneously onto herself. The entanglement with societal role models and their minor transformation through time get autopoetically produced and attacked in this work. Ulrike Rosenbach (DE) was born in 1943, studied at Düsseldorf Academy of Fine Arts and is considered one of the first female artists to include the medium of video in her work. In her videos, performances and multimedia installations, she explores the complexity of female representation. She created her first video works in 1971, taught feminist and media art at the California Institute of Arts (CalArts), and founded the “School for Creative Feminism” in Cologne. Besides having participated at documenta 6 and 8 (1977, 1987), she has had a major retrospective at the Landesmuseum Bonn (2014) and received the Gabriele Münter Preis in 2004. Kathrin Becker (DE), born 1965, studied Art History and Slavic Literatures at the Bochum and the Leningrad State Universities. She is a curator and writer and head of the n.b.k. Video-Forum. Her curatorial practice focuses on the social role of art in society and on the complex of exclusion / inclusion in contemporary cultures. 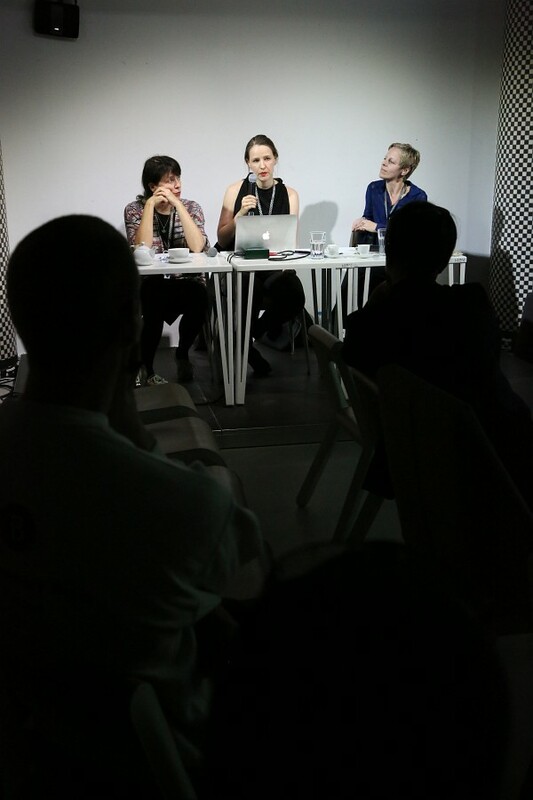 Together with Jana Seehusen, she curates the screening program of D’EST: The Suspension and Excess of Time. 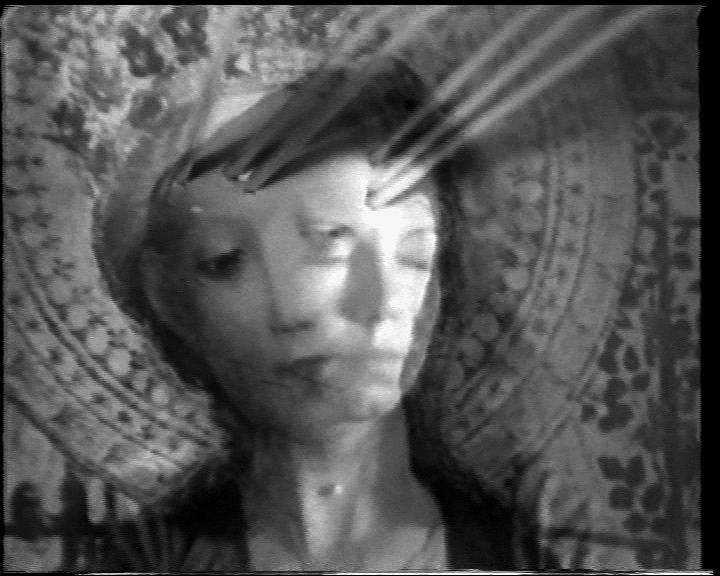 Jana Seehusen (DE), born 1969, works in the field of aesthetic theory practice in film, art theory and cultural studies. She is doing researches about in/visibility and virtuality, experimental film art, subject theory and identity politics as well as gender studies. She and Kathrin Becker are responsible for the screening program of D’EST: The Suspension and Excess of Time. Ulrike Gerhardt (DE), born 1984, is the artistic director of D’EST, and PhD candidate at Leuphana University Lüneburg. 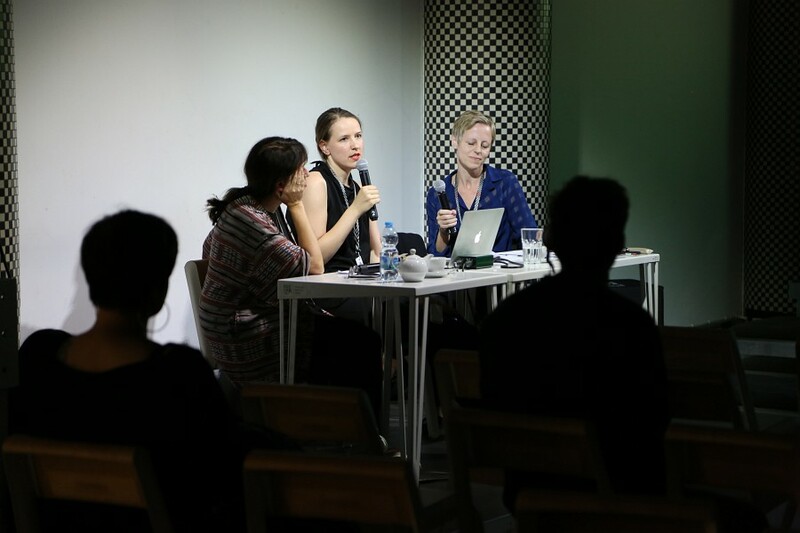 She is a curator and writer on art and cultural theory with a special focus on cultural memory on postsocialism in contemporary art.